All around 24hrs plaque protection, when used twice a day. Gentle, no alcohol burn. Clinically Proven. 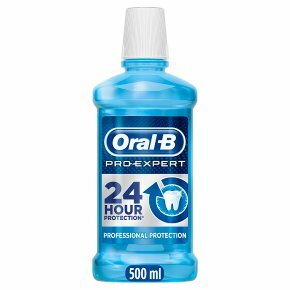 Fresh mint flavour.Oral-B Pro-Expert Professional Protection mouthwash is an effective everyday support to reach all areas of the mouth for 24 hours long-lasting plaque protection, when used twice per day. It gives no alcohol burn and has a pleasant fresh mint taste that leaves a sensation of freshness and cleanliness in the mouth. Fill cap to 20ml line as marked. Rinse mouth thoroughly for 30 seconds and expel. Use twice daily. Do not swallow. Keep out of reach of children. Not for use in children under the age of 6 years. In some cases this rinse may cause surface staining to teeth. This is not permanent or harmful, and may be prevented by adequate brushing or removed at your next dental visit.